Bandit, a special-needs dog, was recently returned to the GWINNETT COUNTY Jail. Bandit didn’t do anything wrong. He’s part of a dog-training program at the jail called Operation Second Chance, where inmates train dogs that get adopted by local residents. 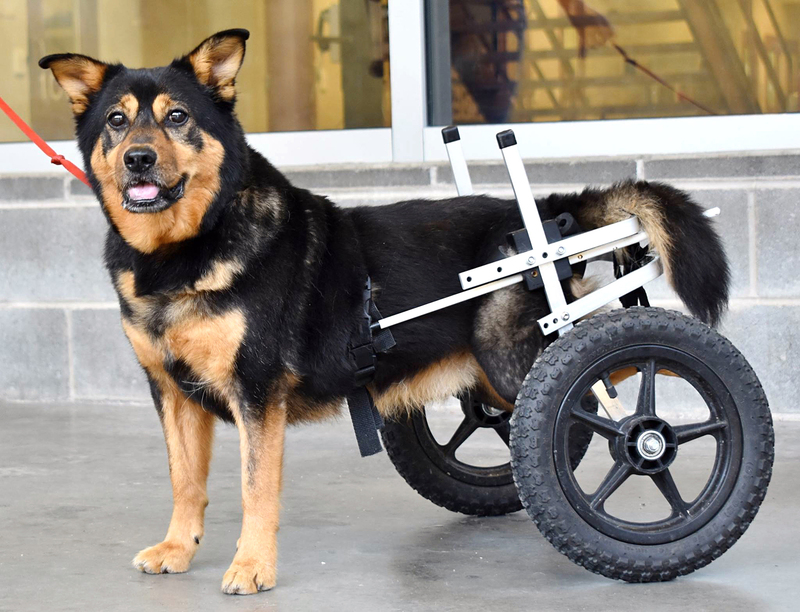 Bandit needs extra TLC because he gets around using a wheelchair to support his hind legs “He just needs a special family,” said Shannon Volkadov, a spokesperson for the Gwinnett County Sheriff’s Office. “A family who can spend a little more time to help him out.” The program is going strong after eight years. The 23-mile long American River Parkway is a beautiful multi-use trail that often doubles as a campground for some of SACRAMENTO COUNTY’s homeless population. The county will hire them to clean up trash and debris along the trail. PRIDE Industries will provide case managers to help participants create work schedules, seek training programs and connect with county navigator services. Each of four 10-week periods will employ 10 different recruits. The program will cost the county $387,200. Last year’s count of the homeless in the county found that more than 3,600 people are living without housing. In September, the county stopped citing homeless campers along the trail. News from Across the Nation is compiled by Charlie Ban and Mary Ann Barton, senior writers. The San Francisco 49ers might not have won many games this season, but they will recoup a windfall of $36 million in tax refunds via SANTA CLARA COUNTY. The county appeals board cut the property tax on Levi’s Stadium to $6 million per year. The San Francisco Chronicle reports that the county must pay a lump sum of $30.8 million by June and another $5.2 million later in the year. Assessor Larry Stone said the “highly out of the ordinary” decision will mean the county will have to refund $5.3 million, while $3.14 million will come from West Valley Community College, $2.86 million from the city of Santa Clara, $1.38 million from the County Office of Education and $13 million from the school district. The team argued that it benefits from the stadium only during football seasons, while the county contended that the team benefits financially during a slew of other events, like concerts. The fire chief now has authority to issue burn bans in ALACHUA COUNTY, after the County Commission voted to allow that change. To issue a ban prior to this change, fire officials had to petition the county commission to declare a state of emergency, and then follow up every seven days to continue the ban, ECJB News reported. BROWARD COUNTY libraries will host free events in honor of Black History Month. In addition to films, festivals and concerts, the county is also inviting the public to check out its African American Research Library and Cultural Center. The 60,000-square foot facility houses more than 85,000 books, manuscripts, artifacts and documents. The facility features permanent and traveling exhibits, a 300-seat auditorium as well as classes and programs for all ages. MONTGOMERY COUNTY is launching a new Jail Chemical Addiction Program thanks to a $43,000 grant from the state attorney general. Sheriff Ryan Needham estimated that 80 percent of the jail’s current inmates faced drug-related charges, the Journal Review reported. Officials hope the program is the answer to the problem. “Our goal is to help treat offenders, assist them with getting on the right track and get them back on their feet,” Needham said at a news conference. The 90-day voluntary program for inmates struggling with addiction will be placed in a separate jail pod and will participate structured activities including housework, homework and individual and group therapy as well as time for recreation and faith. If you’re a senior citizen in QUEEN ANNE’S COUNTY, the voice you hear when you pick up the phone might just be Evelyn Berry. The volunteer for the county’s Telephone Reassurance Program gets in touch with about a dozen residents twice a week, she told the Bay Times and Record Observer. “They just like to talk a little while … a lot of times, it’s the only time they talk to somebody during the day,” said Berry, who is 98 years young. A swimmer and a gardener, she attributes her longevity to “exercise and attitude.” She began volunteering after a 25-year stint working at the local pharmacy. If Berry calls someone and they don’t answer the phone, she reports it to the county Area Agency on Aging, who will send out a Meals on Wheels driver or call a family member to have them check on the resident. WASHTENAW COUNTY is looking to add more local employers to its summer employment and job training program for county youth, according to a report by the website Concentrate. The Summer19 program is a collaboration between the county, Michigan Works Association and the University of Michigan. About 100 young people participated in the program last year. Participants get “soft skills” training before diving into jobs that pay between $10 to $12 an hour. Program officials say this is a great way for local businesses to recruit folks from the local community and build up a local workforce. SUFFOLK COUNTY Executive Steve Bellone recently announced the piloting of a new program dubbed “Vape Out,” to prevent teens from using e-cigarettes or “vaping.” The program was kicked off in response to local schools asking the county health department for help, due to record numbers of students vaping on school grounds, The Suffolk Times reported. The program encourages school officials to require students caught vaping to complete a self-assessment, discuss the harmful effects of vaping and demonstrate “refusal skills.” The county raised the age to purchase tobacco and e-cigarette products from 18 to 21 in 2015. The county also recently increased fines for those who sell tobacco products to minors. E-cigarette use among teens is now considered a health epidemic, according to the Food and Drug Administration. The Oregon Department of State Lands is considering granting a permit for a 299-mile natural gas pipeline across the southern part of the state, but JACKSON COUNTY’s commissioners don’t want that. They sent a letter expressing that point, KATU News reported. In particular, commissioners are concerned that eminent domain could be used against property owners and that leaks from the pipeline would taint water quality. They’re getting rid of milk cartons, plastic utensils and paper plates in MARION COUNTY. The county is using a state Department of Environmental Quality $76,000 grant to roll out waste reduction programs at schools throughout the county the next two years, The Statesman Journal reported. As part of the program, the county will bring reusable goods like cups, plates and utensils to rural and low-income schools. They figure they’re also saving on wasted milk by having students pour milk into glasses instead of drinking from a carton. YANKTON COUNTY is hoping to encourage more participation at County Commission meetings. First, the Commission moved its meetings to 6 p.m. from 4 p.m., giving citizens a chance to attend after work. Meetings will also feature a dual 10-minute public comment period, at the beginning and end of each meeting. The Commission will also film special meetings and budget sessions and publish all meeting agendas in The Press & Dakotan, which reported all of these measures. The Commission may also eliminate the consent agenda. TRAVIS COUNTY commissioners recently approved the implementation of unmanned aerial system or drones, Austin Metro reported. County parks staff will manage the program which will include two drones, Federal Aviation Administration-mandated training and licensing for four staff members. Drones use related to law enforcement aren’t part of the program. A general parks donation fund will cover the costs. County staff requested the drones to capture aerial footage of inaccessible locations for help with everything from monitoring wildfires to manage flood-prone parks. Staff have reported delays in flood-damage assessments or hiking for hours to remote areas to monitor prescribed burns. Hedgehogs are now legal to own as pets in FAIRFAX COUNTY after the Board of Supervisors gave the OK. Neighboring ARLINGTON and LOUDOUN counties had already legalized hedgehog ownership. The Board also lifted the requirement for zoning permissions to keep chinchillas and hermit crabs. Those animals require specific environments, nutrition and care, and hedgehogs can carry a risk of salmonella. The KING COUNTY Council has approved a six-month moratorium on building or expanding fossil fuel infrastructure in unincorporated parts of the county, stalling any plans for pipeline construction. The ordinance requires the King County executive’s office to complete a study on the effects of new fossil fuel facilities in the county and kicks off a regulatory rewriting process designed to update the county’s land use code and permitting regulations to ban new major fossil fuel infrastructure permanently, Seattle Weekly reported.